We have Just moved into a new house that has a 3 zone radiant floor heat system. I have never had a system like this before. I have always just been electric forced air systems so I have a few questions. About the system: Electric Boiler- Thermolec 27kw with a Taco SR-503 Relay zone controller and 3 (3 speed pumps) one for each zone. Zone one has 4 loops. Zone Two has 10 loops and zone 3 has 3 loops. My question (one of many to come I'm sure) is this. On Zone Two, the Thermostat is in the Master Bedroom and set to 72 deg. The great room is on Zone 3 and has a separate thermostat in that area. The Kitchen and Dining (attached to the great room) are all on Zone Two. I have the thermostats both set to 72 deg. However zone 2 runs ALL the time and very rarely shuts down. Zone 3 hardly ever runs. It is 78 deg in the greatroom / Kitchen area and 73 deg in our master bedroom. I am Assuming since zone 2 runs a lot more that is putting bunches of heat in the greatroom kitchen area thus making it so much warmer than the bedroom where the termostat is. The bedroom for whatever reason tends to stay fairly chilly thus the call for more heat. The Manifolds have the Red Cap Flow Meters on the hot side and White shut off Knobs on the cold side. All Flow Meters are showing around .6 GPM flow. Do I need to adjust the flow rate to the kitchen / dining loops to be less maybe? Or is there some other Adjustment that can be made to even the heating out across those 10 loops? I'm looking for tips / education on how this system works! Oh I forgot to mention the temp on the boiler is set at 120 deg and is running between 15-20 psi. Zone One and Three have a Delta of 20 and Zone two is a Delta of 10. Was a design done that would show you what the flow rate is suppose to be in the various loops? If not, some trial and error to dial them in as you suggested. Does that boiler have outdoor rest control onboard? If so that will help even out heat delivers, adjusting supply temperature across the heating season. 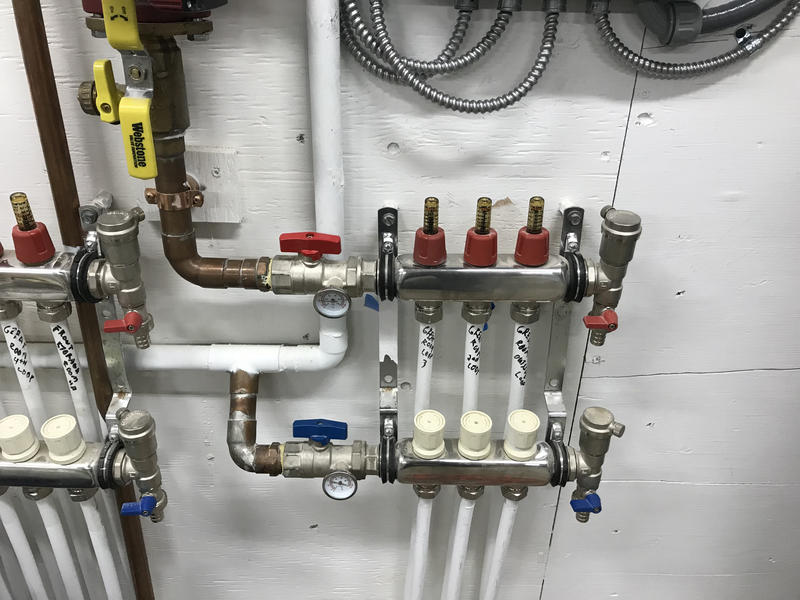 Assuming that enough tubing is installed in all the areas to cover the heat load, as .6 is about correct for 1/2 pex loops. Also confirm the thermostats are in fact wired to the correct zone pumps, could be a wire crossed. And that when the thermostat is turned down, that circulator does in fact shut down. 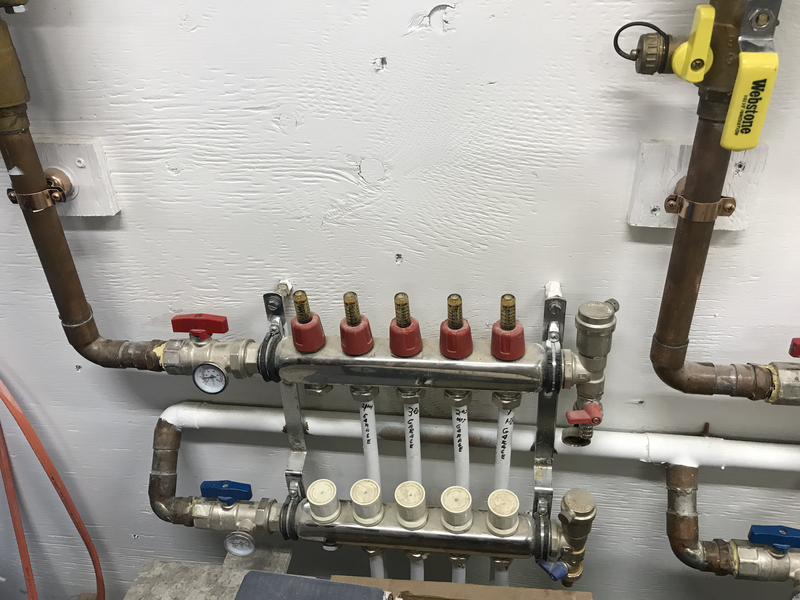 Simple first steps, there could be a mis-piping causing ghost flow in zones, a pic of the boiler piping would shed some light. thanks for your response! I have checked that the thermostats are wired correctly for each zone. I went threw all the paperwork that was left with the house and there was a manual for the boiler but no heat loss or calcs / design of any kind that I saw. For the Zones I'm going off of what is written on the loops on each zone and also just feeling the heat on the floor when each zone is open so I'm pretty sure they are zoned how it is written on the pipes. Zone 2 is by far the largest spreading from one side of the house to the other. 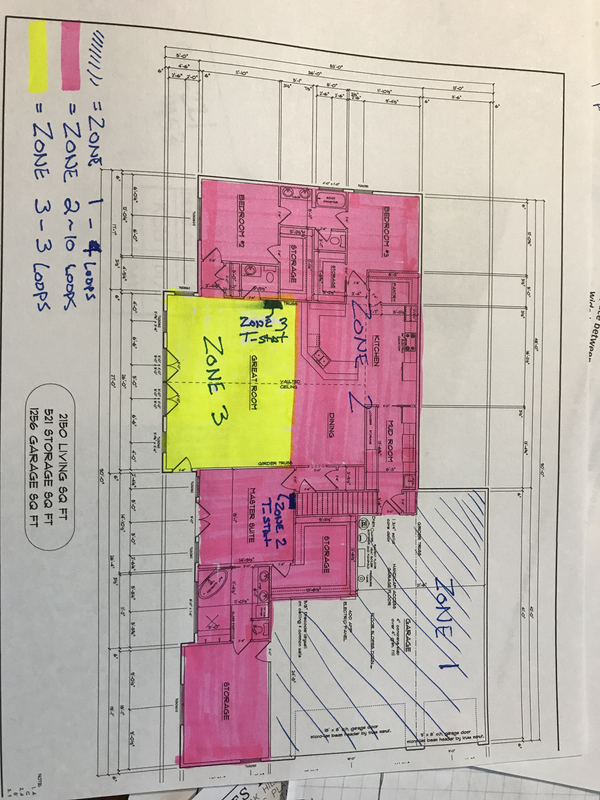 Pink zone on the attached picture. Looking at the entire system Zone 1 is on the left Zone 2 in the middle and Zone 3 on the Right closest to the boiler. I included a close up shot of the manifolds as well. As far as the Outside Temp Reset. I found that sitting near the boiler but not installed. Looks like I need to run a wire outside to get that set up. Let me know if you have any other questions and I'll do my best to answer! 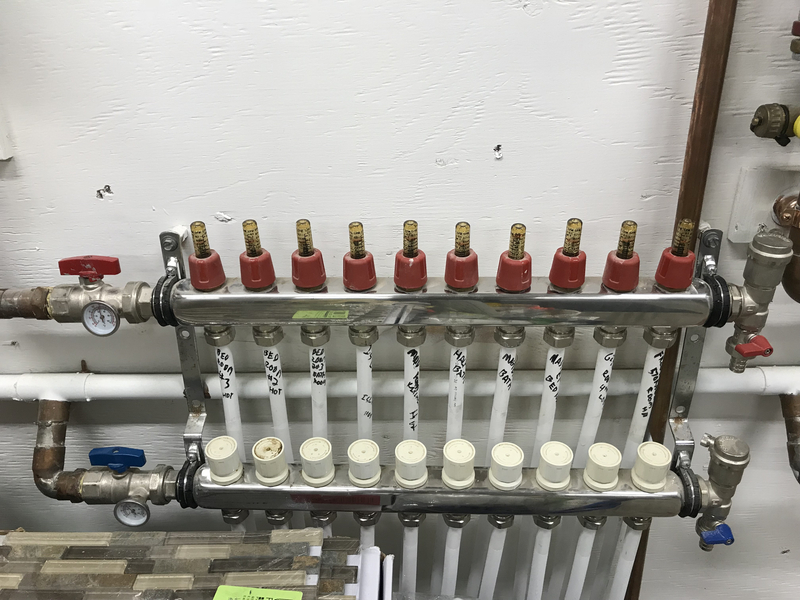 can you still read the flowmeters on the manifolds? Be sure all loops are seeing .5-.6 gpm. Check valves in those pumps, I hope. If you can borrow, or buy an infrared camera you can confirm which loops are performing or under performing. With 7 loops it will take some time to dial it in. Is there carpet in any of the areas? No Carpet, The Great room, Kitchen, Dining, and Mud room are all acid stained concrete. The Bedrooms and Storage/Office area are LVT Plank. All Flow Meters are between .5-.8 GPM. So if I adjust the GPM Flow does the Temp in that loop get lower with a slower flow and Higher with a higher flow? I'm assuming a higher flow means more BTU's per HR flowing thru the loop which would be hotter and slower GPM would be less BTU's per hour and lower over all temp. But Never having a system like this I don't like to assume anything. I also have no Idea about the check valve in the Pumps. I'll get the model number off them and google that this evening! Correct, lower the flow rate for the areas over heating. Remember it can take hours for a high mass system to respond, so it will take time to get it dialed in to your liking. Is the garage being maintained for working in? 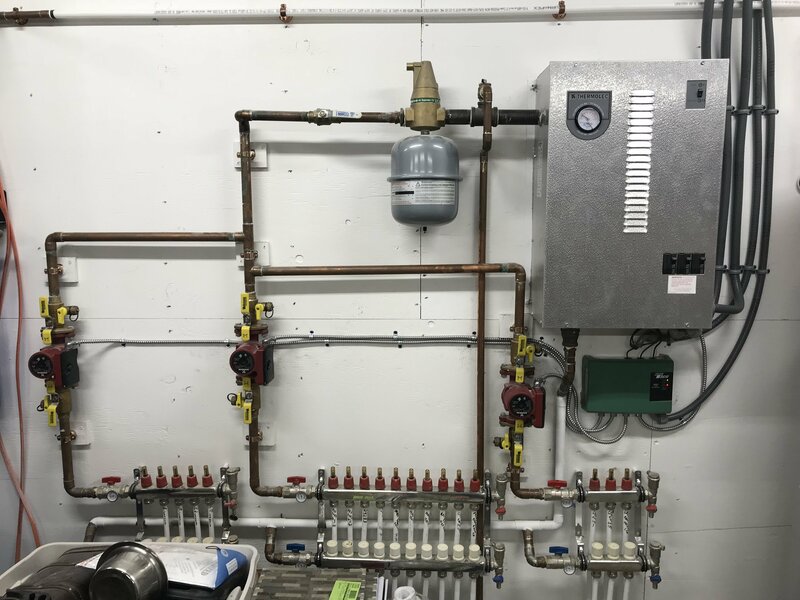 That would be one zone to run lower temperature, to keep energy costs inline..
You should have plenty of boiler power 92,000 BTU/ hr for 3900 square feet. What are your electrical rates? 8.7 cents / KWH I plan to keep the garage set at 50 Deg Unless I know I have a project coming up on a weekend and then I will up it to 60-65 a few days prior so it's a bit more comfortable. The Entire back wall of the home is buried in the hill side and is 10" thick concrete 3 of the other walls are shared with heated space and the exterior wall with the doors on it are 2x6 sprayfoam insulated with R-19 Insulated Doors so it stays a pretty decent temp without having to run Zone one very often. If at all on most days to maintain 50 Deg. I plan on making small changes and waiting a week to see how the system responds and then go from there. Just wanting to make sure I was using the right mindset! I had two forced air furnace running before getting this system online so I'm eager to see which one is cheaper to operate. Sounds like it will be a very energy efficient home. Could be that boiler is twice the size you will need. I believe it stages in the elements to prevent short cycling, get the reset control connected and adjusted, that will help smooth out the slab temperature swings. Awesome will do thank you for the info! One more question, I got the outdoor reset installed and I think I have the system pretty balanced. Is it better to run the boiler at a lower water temp for long periods of time or a higher water temp for a shorter duration. Just trying to maximize my efficiency and minimize my electric bill. Ideally the system would start at the beginning of heating season and stop when the season ends.